2009 of course wasn’t only about new releases, I spent plenty of time listening to music released earlier, sometimes much earlier. Of course I also caught up on some releases I missed from the previous year, several of which should have made my list that year. Most egregiously missing was this amazing DVD of John Cage’s Variations VII from the 9 Evenings: Theatre & Enginnering program. This disc was released mid 2008 and I had been eagerly awaiting it’s release for weeks. I wrote an entry on this as well as the other 9 Evenings release to date Robert Rauschenberg’s Open Score in this post. As of this disc coming out, this seminal performance of this Cage piece had never been released and had remained unheard since the performance. The DVD contains a documentary made up of the color and black and white film that they shot (alas not the entire performance) as well as a audio only track of one of the two performances. The music is raucous, filled with the noises of the city from numerous open phones, plus tables filled with Tudor and Cage’s electronics as well as contact mic’d everyday objects (such as blenders) triggered by movement, optical sensors and the like. For around eighty minutes layers of sound, cacophonous at times, haunting at others fully occupies the soundworld. It is one of those rare historical moments that is not just significant but is excellent music. The video is fascinating, a chance to see the tables of equipment and Cage and Tudor working them along with other assistants and musicians. The tangles of wires, the Bell Labs engineers striving to keep the lines open and the experimental electronics working and way behind the lights a packed house to see this radical music. The series will eventually contain all of the pieces that were performed at the seminal 9 Evenings with David Tudor’s Bandoneon ! up next. This one of very few unavailable Tudor compositions (and an early important one), were I to do a list next year, would be sure to feature on it, if not top it. I’d been aware of the Neos label for awhile, but it wasn’t until the first part of 2009 that I actually picked up a couple of their releases that had been on my “to buy” list for a long time. These were two albums of works by American experimental composers with Munich based Sabine Liebner playing piano. I’d heard a few pieces previously by Liebner and have been long impressed with her touch at the piano. 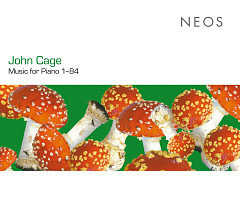 Her recording of John Cage’s Music for Piano 1-84 is easily the album I listened to the most this year. I am of course quite familiar with numerous of these pieces from David Tudor’s excellent recordings (beautifully collected on the essential Edition RZ release David Tudor: Music for Piano) but there doesn’t seem to be a complete recording of the entire set of Music for Piano by Tudor. Additionally Liebner performs these pieces in a dramatically different way then Tudor: many of these pieces allow for the tempo and dynamics to be left to the performer and Liebner choses a soft, spacious, almost Feldman like approach. The notes were worked out with systems utilizing the imperfections in paper and there are various other instructions (especially in the later pieces) that allow for longer silences, overlapping pieces and use of extended techniques and preparations. This makes this album for me one of those perfect ones to listen to in various contexts: intently on my primary stereo, as background while reading or, and this most often, put on as I’d go to sleep. It rewards close attention with its pauses, variety of sounds, controlled randomness and presence, but also can meld with the background allowing one to engage in other tasks or drift off to sleep. One of the things that makes Cage’s compositions so wonderful is that they provide and endless amount of variety inside an always recognizably Cagean framework. This recording of these pieces complements the Tudor’s versions perfectly and aptly demonstrates the veracity of this statement. 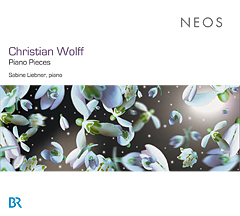 The second of the Sabine Liebner Neos albums I acquired was Christian Wolff Piano Pieces which was originally released May of 2008. I have long loved Wolff’s music, especially his piano pieces, but I’d heard few recordings of these beyond a few early pieces recorded by Tudor (again see the Edition RZ David Tudor: Music for Piano), the fantastic John Tilbury recording, Christian Wolff Early piano music 1951-1961 on Matchless and a Mode recording of the Tilbury Pieces. Wolff’s music does not lend itself to glib assessments and I’ve often resisted writing much about it for this very reason. The pieces on this disc are a series of pieces that Wolff had dedicated to John Tilbury and are appropriately enough titled Tilbury 1-III along with Snowdrop and 15 very short pieces under the heading Keyboard Miscellany. Now I was familiar with Tilbury I-III and Snowdrop from the very fine Mode recording of the Tilbury Pieces (complete) (which contains two additional Tilbury pieces, Tilbury IV and V that aren’t solo piano and thus not on this recording) and again this performance is a beautiful compliment to that recording. The Tilbury Pieces and Snowdrop are composed using chance techniques but there doesn’t seem to be much (if any) indeterminacy of performance beyond that found in performance of all composed music: differences from the instruments, the room, the recording techniques and of course the performer. These are wonderful pieces that seem to capture Tilbury’s unrivaled patience and touch at the piano, distilled into gentle yet powerful music. The Keyboard Miscellany are quite interesting with greater diversity of dynamics, tempos and sounds then the Tilbury Pieces. They seem to be little sketches, ideas that Wolff was playing with that he felt were interesting enough to jot down, if not expand into an entire piece. But buried amongst the miscellany is the sublime Variations on Morton Feldman’s Piano Piece 1952 a ten minute piece that takes Feldman’s composition to place that only Wolff would have. A wonderful little congruence of these two composers and friends of the New York School. There were of course many more albums I caught up on in 2009 but these three, considering how much plays they got and how much I love them I felt deserved to be highlighted. If they slipped beneath your radar as well, consider it well worth rectifying. A Spiral Cage is powered by	WordPress 4.6.14 and delivered to you in 0.316 seconds using 22 queries.